Halloween is my favorite holiday. It’s a celebration with no expectations. No one expects cards or gifts, except for the kids who come to your door to Trick or Treat. Halloween In Uzes there’s very little evidence of the tradition. Only plastic scarecrows, owls and pumpkins in a few shop windows.Some younger children go out in costume to trick or treat, but it’s not over-the-top like in the US. There is one exception — the salon of my new hairdresser. The owner, Rosie, loves Halloween. She gets a kick out of decorating her salon with the typical Halloween skeletons and witches. Mostly she enjoys sneaking up with a scary mask and waking clients when they’ve dosed off to sleep. Perhaps wrapping the bright red lights around me when coloring my hair last week was really a trick! No one in Rosie’s shop speaks English. So imagine the fun it was trying to explain how to color my hair. After the first visit my head looked like I had on a blonde cap with platinum fringe. When I returned during the week to ask for a “re-do”, I simply explained the problem in sign language and one word of French –” chapeau”. Rosie (pictured on the left) and Sophie the colorist (on the right) understood right away that I didn’t want to look like I had a hat on my head with blonde fringes. It may have taken two visits to get it right, but everything turned out OK.. They took notes for next time. 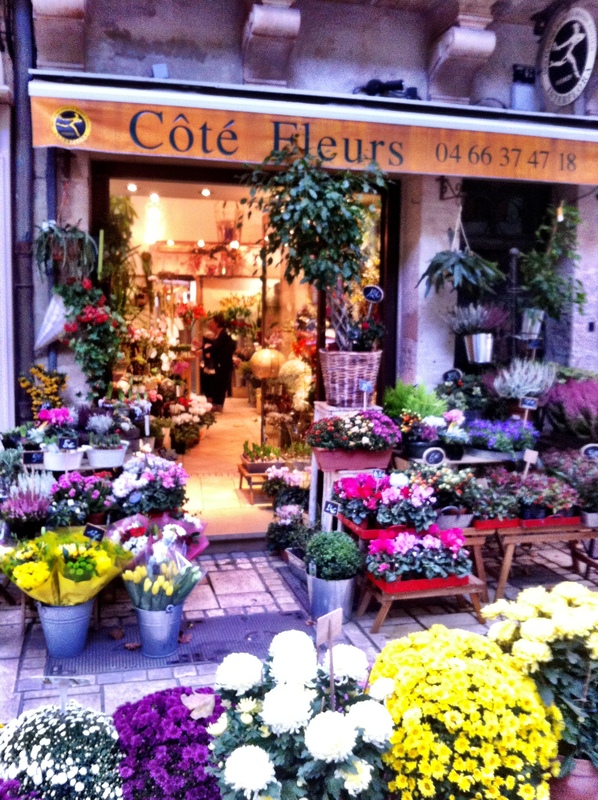 The proliferation of chrysanthemums around the town’s flower shops are a sign of the celebration of All Saints Day — La Toussaint. It is customary to honor the deceased during church services and at gravesites with bouquets of chrysanthemums. The holiday is widely celebrated with banks and businesses closing. While I’m on the subject of cemeteries, I have to tell you about my first experience attending a funeral in France. Geoffrey called on Monday morning and asked if I’d like to go along with him to a friend’s funeral. It sounds like a strange request to many of you, but Geoffrey knows I’m interested in all aspect of life in France. Although I had an evening planned with my new friend from the furniture store, I stopped by the shop to tell her we’d get together another time. Funerals might not be easy to find. The funeral was scheduled for five o’clock in Bagnols, a nearby town. Fortunately we left before three o’clock to make the 45-minute drive. Arriving in Bagnols at the only cathedral in town, we walked around the block looking for the funeral crowd. No crowd. No funeral. Nothing but an empty sanctuary. Since Geoffrey’s notice of the funeral was only word-of-mouth, he apologized to me for the mistake, then suggested it might be a grave-side funeral. The deceased was from Ireland and very few people were expected to attend his services. Dressed in our “Sunday-finest” black clothes, we were determined to find the funeral. So we set out to find the cemetery. With no instructions, we drove around town and we found a florist shop. Surely they would know where there was a funeral. Bingo. They directed us to the city burial grounds just in time. Arriving just as the few mourners were gathering to follow the hearst to the graveside, we joined in silently. The hearst pulled alongside the grave and opened the large back door of the car, exposing a simple oak coffin. Now, it might not surprise you to see a wooden coffin, but I don’t believe that, outside of a movie, I’ve ever seen anyone buried in one. The coffins we use in the States are quite elaborate. A group of pallbearers lifted the coffin from the hearst using corded ropes and gently placed it on the ground. Learning more about the deceased, I understood the simple ceremony. He had left Ireland and was living quite alone in France. A brilliant architect who had fallen into the wrong path through alcohol addiction, he had lost touch with friends and relatives. At the end a poem by Robert Burns — a Scott — was read by a friend of the deceased — also a Scott. Saying “au revoir” to the funeral guests, Geoffrey asked if I would go to his friend’s favorite bar for a final farewell. Still looking for adventure, of course, I said “yes”. The bar was almost as empty as the sanctuary. And the bartender was just as lively as a corpse. Nevertheless, Geoffrey and I clinked our glasses in honor of the solitary man who lived hard and died suddenly, quietly, alone. While talking about cheese, I’ll admit I had no idea how to store it properly. Fortunately I overheard an English-speaking person at the market talk about a “cheese box” she pulls out of the refrigerator prior to serving cheeses. That’s when I remembered the glass Pyrex container with a red plastic cover I had purchased to use for baking. Seals tight. Fits well into the refrigerator shelf. It’s perfect for storing the wide collection of cheese I buy to sample each week. Since most of my shopping is done at the Saturday and Wednesday markets, purchasing meat is straight from the butcher, straight from the farm. Having first time experiences is becoming the norm, yet I must say, buying and preparing a whole chicken was a little testy. After I got over the initial shock, I put a cloth over her head and chopped off her head. Then off went those extra “thingys” on the end of her legs. What’s that about, anyway? She ended up making a delicious meal by putting her into my new red Pyrex crockery pot with a little water and spices. Next time I’ll surely be a pro. Maybe I’ll do like the French and use the head to prepare something wonderful. Up until the last two days, it’s been very warm here. It’s much like the weather in the Low Country of South Carolina this time of year. So the Saturday market vendors are still out in full force. That means “take out” food that is served up while you wait. 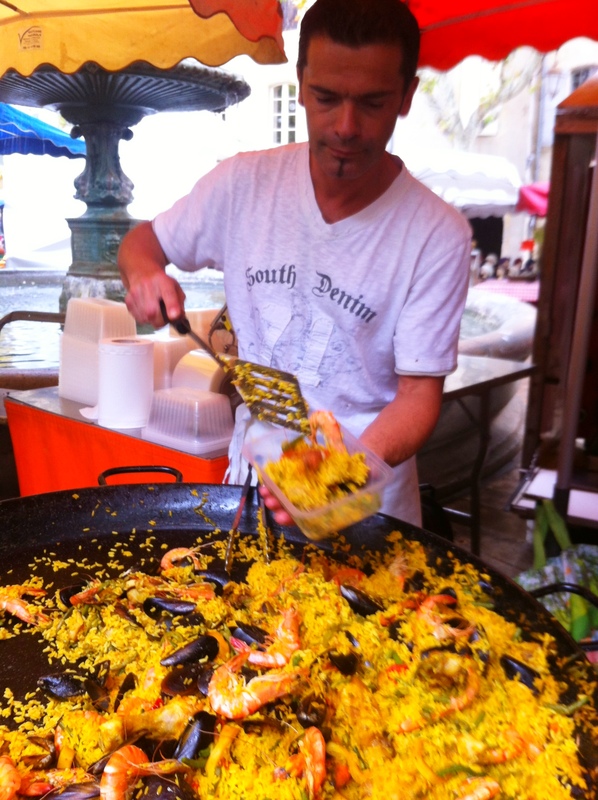 Last Saturday I treated myself to a hearty helping of Paella. I would venture to say it’s prepared much like you find it in Spain, Big unshelled shrimp with mussels and chicken pieces bask in a scrumptious bed of saffron rice and spices. C’est bon! Yum! I sure miss enjoying good food and wine with my buddy! You know I miss you too!